Dr. Cole's path to becoming NCNW's new chair began during her childhood when she and her sister had the privilege of being mentored by Dr. Mary McLeod Bethune, a longtime friend of her great grandfather. Dr. Bethune counseled the young sisters about the importance of education and being of service to others. She heeded Dr. Bethune's advice as her career and service exemplifies. "When social justice is on the menu, I promise to ensure that NCNW has a seat at the table and I'm committed to preparing the next generation of women leaders so NCNW can continue to be an influential power in the ongoing struggle for equality," said Dr. Cole. "As a lifetime member of NCNW, Johnnetta is well suited to steward the legacies and promises of Dr. Bethune and Dr. Height," said Ingrid Saunders Jones. "With more than 650 delegates representing more than 200 sections and affiliates from across the country coming together in unity to achieve the smooth transition of leadership, including the acceptance and installation of a slate of 22 officers by affirmation, NCNW is in good hands." A woman of many firsts, Dr. Cole served as the president of both historically Black colleges for women in the United States, Atlanta-based Spelman College and Bennett College in Greensboro, North Carolina. She served as director of the Smithsonian National Museum of African Art. Dr. Cole was the first African American to serve as chair of the board of United Way of America. She also served on a number of other corporate boards: Nations Bank South, Home Depot, Merck; and was the first woman to serve on the board of Coca Cola Enterprises. 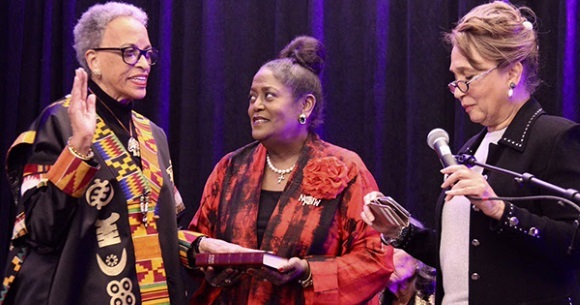 She has authored and edited several books and numerous scholarly articles; and has received numerous awards, including a NCNW Uncommon Height Award and 68 honorary degrees. Dr. Cole is principal consultant with Cook Ross, Inc., a consulting firm in Silver Spring, Maryland, and is a member of the board of Martha's Table. She is a fellow of the American Anthropological Association; and holds memberships in several diverse organizations including the American Academy of Arts and Sciences; Delta Sigma Theta Sorority; and the Links, Inc. She resides on Amelia Island in her home state of Florida.